I leave the Arizona desert in a few short days to begin my fourth pilgrimage to the tomb of the Apostle Saint James. Why do I do this? What is it about the Camino de Santiago that keeps calling me? I am not certain of the answers to these questions. I will say however, the Camino has given me a new life. Or perhaps it has afforded me the time to think about the life I am currently leading and time to think of ways to enrich this life. The Camino has definitely widened my circle of friends to include people both local and from many different countries and continents. I do know each time I return from Santiago I have made changes in my lifestyle. After my first pilgrimage in 2012, I formed and still currently chair the Old Pueblo Chapter of American Pilgrims on the Camino. The Chapter has brought me many new friends. I can say the Camino has given me a social circle of like-minded people. During my second pilgrimage in 2013, I finally made peace with some deep regrets I’ve carried with me for years. Upon my return home, I also found myself clearing my life of clutter. I donated many, many items to charity. But most importantly I realized we don’t need things to make our lives full. 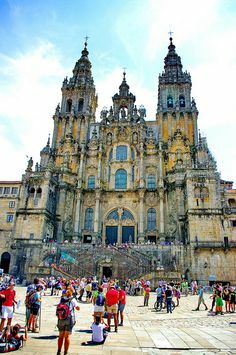 After my third pilgrimage, just this past April, I realized a deep need to give back to the Camino. I am currently mentoring a prospective pilgrim. But most importantly, during that pilgrimage I was inspired to open an albergue or casa rural on the Camino de Santiago. I wonder what this Camino Inglés will reveal. Where will it lead my life once I’ve returned home? Maybe the reason I do this is simple, maybe it is to become the best person I am capable of being. And maybe that is exactly why I am called to Pilgrimage.